Swamp Thing #14 Original Splash Art by Nestor Redondo. Spectacular Splash Original Artwork for Swamp Thing #14 (DC, 1975) by the talented Nestor Redondo (pencils and inks). This impressive image speaks for itself, as the startled Swamp Thing is ambushed by a gargantuan army ant , struggling for his life to free himself from the powerful mandibles. Redondo would prove himself to not only be a suitable replacement for Bernie Wrightson on this title, but a worthy successor. You will be hard pressed to find a finer Swamp Thing splash page anywhere in the marketplace. Excellent condition with image measuring 10" x 15". 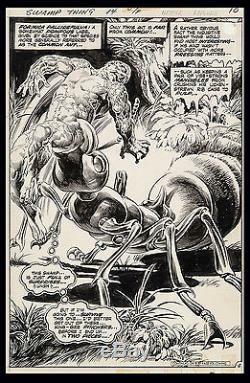 The item "Swamp Thing #14 Original Splash Art by Nestor Redondo 1975" is in sale since Thursday, December 04, 2014. This item is in the category "Collectibles\Comics\Original Comic Art\Splash Pages". The seller is "water-walker" and is located in San Diego, California. This item can be shipped to United States.